Major coastal resort and historical city, Sousse has two faces. Enjoy the enormous beaches of Sousse and Port El Kantaoui, go out to a restaurant or a a nightclub. Or visit the exceptional medina, declared a UNESCO World Heritage Site, and other magnificent historical cities in the area. 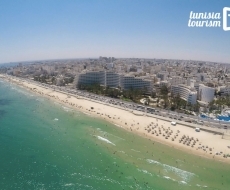 An immense beach of white sand stretches from the Sousse city centre as far as its neighbour Port El Kantaoui, a pretty coastal resort complex arranged around a golf course and a marina. Large hotels and holiday clubs compete for your attention, offering relaxation and varied activities for all ages. Are you a sporty type? Roam along the coast jet skiing or windsurfing, work on your technique on the tennis pitch or golf course. Looking to completely unwind? Treat yourself to an exotic massage, a session in the hammam or a full-course spa treatment with Tunisian flavour. Prefer to feast your eyes on the blue of the open sea? Climb aboard a pleasure cruise boat or take some scuba diving lessons. Sousse isn’t just a seaside resort, it’s also a major city with a penchant for staying up late: its restaurants, lounge bars and nightclubs are particularly lively. Don’t miss visiting the exceptional historical sites gathered in this former military port from the early Middle Ages. Walk along the imposing crenellated ramparts and enter the ribat, a fort. Climb to the summit of its high tower: you will discover an extraordinary panorama across the roofs of the medina, the sea, the courtyard of the great mosque, and on the hilltop the imposing silhouette of the Kasbah, the great medieval fortress… Explore the narrow streets, visit a historic house, haggle for a few souvenirs in the souks. At the top of the medina you will find an archaeological museum which houses a number of the most beautiful mosaics in Tunisia. There is much to see in and around Sousse. Its medina has preserved a medieval appearance and several monuments from the 9th century. Its archaeological museum is one of the most important in Tunisia. And neighbouring cities such as Monastir and Kairouan are also rich in historical heritage. Declared a World Heritage site, the medina of Sousse is surrounded by perfectly preserved stone ramparts from the 9th century. Its narrow streets snake around the hillside, while small plazas, staircases, vaulted passageways alternate one after another… carved doorways, domes and ancient minarets give it a unique appearance. This fort from the early Middle Ages once sheltered a community of ascetics who kept watch over the coast: its high tower was used to send messages with light signals. It is one of the most ancient Muslim monuments in Tunisia. More information. Surprising in its sobriety, this mosque is flanked by massive towers but devoid of minarets. Wax mannequins reproduce scenes from a long ago way of life: parties, cooking, weaving… This small museum is housed in a former caravanserai. Admire its facade and its large dome, decorated on the outside with zigzag patterns: they date from the 11th or 12th century. The Kasbah is the large fortress that dominates the whole medina from its hilltop. With its crenellated walls and its square bastions, it appears straight out of the Middle Ages. A high tower looms over it, made of several floors like the legendary lighthouse of Alexandria. The Sousse region was one of the finest producers of mosaics in the ancient world. This museum houses some remarkable examples: they will transport you to the universe of the Romans. Admire the portraits of Neptune and the god Ocean, follow the victory procession of Dionysus, spot the amusing scene of a Nile crocodile swallowing a donkey, or hear a toga-garbed actor make a declamation… but don’t let yourself be seduced by Medusa’s gaze! Via motorway or via train, visit Monastir, a city famous for its Ribat. Unlike the small Ribat of Sousse, the one in Monastir was enlarged throughout the centuries. Today it is an imposing fortress standing facing the sea. Superb viewing point from its lookout tower, and small museum. Read more. The first Muslim capital of the Maghreb has preserved a number of illustrious monuments (Great Mosque, Aghlabid Basins, Sidi Shabi Mausoleum…) and a magnificent medina, declared World Heritage Sites. Read more. A major coastal resort, Hammamet is worth a visit for its charming medina surrounded by ramparts. 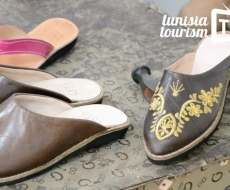 The neighbouring city, Nabeul, is a major centre for handicrafts: pottery, wrought iron, rush mats... Read more.